All over the world, there are hundreds of millions of people who have not heard the Good News that the Supreme Creator God of the universe knows them, loves them, has a plan for their salvation and wholeness, and has provided the way for this to occur through His Son Jesus. I have recently become burdened by this reality: that so many have never even heard this news that I simply take for granted… what happens to them? I was reading a book this week that described the spread of Christianity after the death and resurrection of Jesus, and I was struck by one simple statement about half-way through. The author was describing northern Africa and said that Christianity did not begin to take root in that region until about 180 A.D. Once established there, northern Africa would become a bastion for Christian thinking and expansion for centuries to come. But I was left wondering what may be one of the most fundamental questions of Christian evangelism: what about all those who lived and died in northern Africa from the time of Christ’s resurrection until the year 180 A.D.? Before their region was evangelized? What happened to all of those people? Were they like those Paul wrote about in Romans 1? Did they have all creation as a witness to the one true God, and therefore were without excuse but to turn to Him in faith…? Isn’t that the question we have for all who go unevangelized in their lifetimes? What happens to them? Christianity only spread around the region of the Mediterranean Sea between 70 A.D. and 180 A.D. What about all the people who lived everywhere else in the world at that time? Places where the Gospel would not reach for many centuries? India, China, Japan, and Polynesia to the east? The British isles and Scandinavia to the north? Sub-Saharan Africa to the south? The native peoples of North and South America to the west? What about them? And what about the unreached in our day? I felt compelled as a result of these thoughts to take a few minutes each day this week to search out, learn about, and pray for the evangelization of one new unreached people group each day. But I didn’t really know where to begin. So, I did a simple web search of the words “pray for unreached people groups” and clicked on the first site that showed up in the search results. It was from an organization called The Joshua Project, and they provide a free, ready-made prayer guide right on their web site called “Unreached of the Day”. For instance, today’s unreached group to pray for were the Xiaoliangshan Nosu of central-south China. 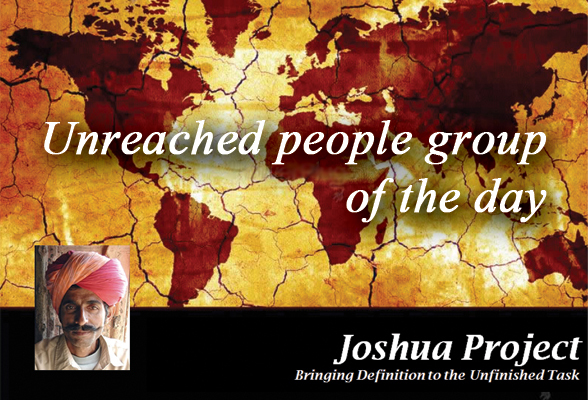 Here is the web link to the Joshua Project’s Unreached of the Day resource, if any of you want to check it out. 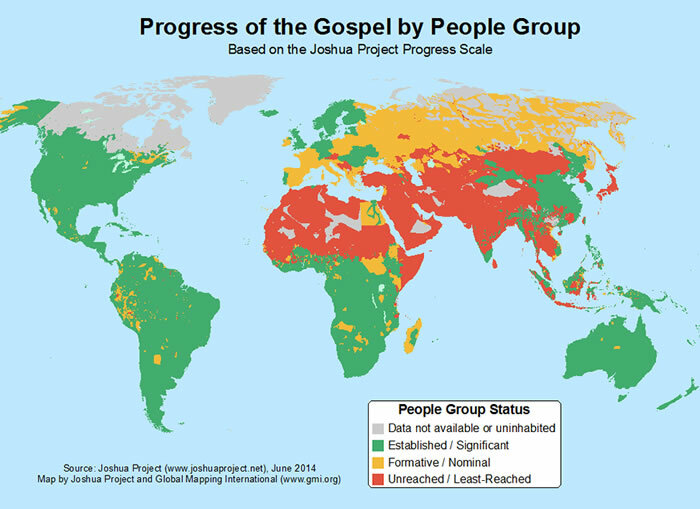 Each day, the Joshua Project site provides a new unreached people group to pray for, including a brief group profile, some demographic information, a few photos, an historic summary of the group, a map of where they are primarily located, and a few specific points for prayer for the group. It’s exactly what I was looking for! Also on the site, the Joshua Project advertised their app for mobile devices that helps you pray for a new unreached people group each day. 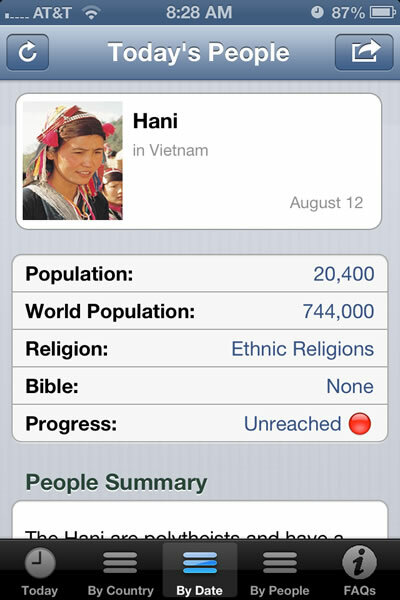 I checked it out and found that it is a free app called JP Unreached. I downloaded it right away, so now I have access to the Joshua Project’s daily unreached people group on my mobile device! It’s such an easy way to bring new guidance to my challenge of being more prayerful for the salvation of the nations. How do you pray for those unreached by the Gospel around the world? What tools, resources, or reminders do you use to guide your prayers for them? Please share your ideas in the Comments section below! Thanks for this great resource, Nick! Please hug your wifey for me! Haha :-) thanks, Gina — will do!